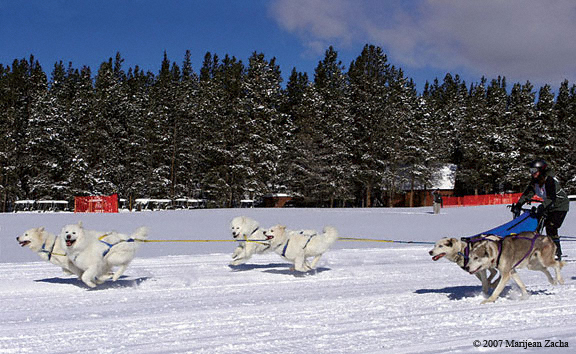 Here is our team at the 2007 Mount Massive Sled Dog Race in Leadville, Colorado. This picture captured all 16 dog-feet in the air. I was very proud of all the dogs: Lightning (left lead), Moonrise (right lead), Canyon (left wheel), and Nimbus (right wheel). Lightning and Moonrise (who are siblings), celebrated their seventh birthday earlier in the year. The whole team worked as if the altitude and warm sun were of no importance. This was a fabulous race site on the highest golf course in North America. The course went out along a fairway, then wove back and forth through the forest before returning. The two grey dogs on the far right are another team that left the starting line at the same time we did at this “dual start” race. We had never started this way before, and it went really well. As you can see, we beat the Alaskan Husky team out of the chute, and followed them closely for a mile or two. This was one of the races that helped our team earn the SCA Top Sprint Racing award for the 2006-2007 season, as well as the 2007 OWS Sled Dog Racing award. Our dogs won these awards all three seasons they raced. Running this team was a dream come true! 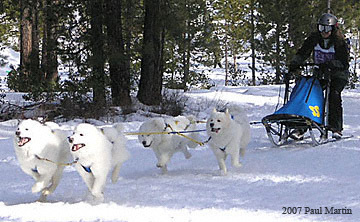 The 2007 Siberian Rendezvous, Sammies Too race took place above Glenwood Springs, Colorado. It was a race for pure-bred teams only. The course was nearly 10,000 feet high, and a bit steep. We all felt the thin air, but still the team ran hard and finished the race with a respectable time. Lightning (left lead) and Moonrise (right lead) were seven years old at this race. The rest of the team consisted of Nimbus (right wheel) and Canyon (left wheel). 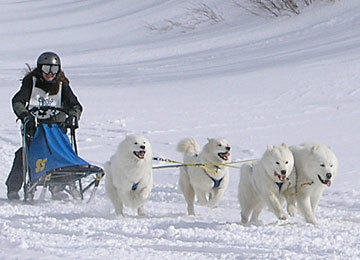 In the 2007-2008 winter season, we borrowed two wonderful girls from Kay Hallberg of Wolf River Samoyeds. Moonrise (right wheel), an experienced sled dog, and Canyon (left wheel) added a great deal of power and enthusiasm to our team. The Chemult Sled Dog Race in Oregon was my first time racing a four-dog team, and it was just thrilling. The course was incredibly fun, and beautifully groomed. The dogs ran hard and strong. This race helped our team to win the SCA Top Sprint Team award for the season. I think our boys, Lightning (left lead) and Nimbus (right lead), enjoyed having the girls helping them out.